Play the entire first chapter of the acclaimed 3D survival horror shooter for FREE! 7 years after the tragedy in Raccoon City a lone zombie is released into a bustling American airport. Panic grips the crowds as more passengers are turned, and an ordinary autumn afternoon becomes a nightmare. 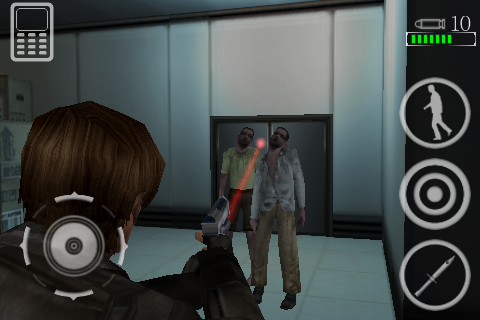 Resident Evil: Degeneration™ Lite uses a full 3D engine and console quality graphics to immerse you into a terrifying survival horror experience. Use your in-game PDA to collect intel, manage inventory and access maps. “Laser targeting” allows you to make aimed accurate shots. Backgrounds, character models and objects are all rendered in full 3D. Intuitive context sensitive control scheme. - Action icons pop up as needed. - Shake iPhone/iPod Touch to “Shake off Zombie” melee attacks. - Shake device to reload.